Desertscapes, ocean cliffs, red rocks – it doesn’t take a seasoned traveller to know that Australia is home to some of the best views in the world. Every state and territory is home to a diverse range of rich scenic grandeur, ready to inspire and excite you. For our Readers Choice issue, we asked the Australian Traveller community to vote for their all-time favourite views around the country. Among the readers, tourism operators, local and international travellers, the nominations were eye-wateringly beautiful. And we knew condensing them to 100 would be quite the difficult task. That’s why we decided to go to people whose job is to travel the country looking for jaw-dropping views: professional photographers. So we got together a panel of our country’s best clickers to judge a selection of the sights. There’s a car park on Old Renmark Rd. Explore 400 acres of sand dunes solo or take a private tour, arranged through Wentworth Visitor Centre. Keep an eye out for the God Tree, a Murray River gum said to be over 500 years old with its trunk buried deep in the sand. It’s behind the car park shelter over the nearest sandhill. The Nut State Reserve is walking distance from the town’s CBD. There is a chairlift and a walking track to the summit of The Nut, which offers spectacular views across Stanley and the Bass Strait. However, the view pictured was taken from Highfield Historic Site, looking south-east. Stanley. With the famous “nut” in the background. Starting in Cairns, drive along the Captain Cook Highway towards Port Douglas. It takes under an hour, giving plenty of time for stops along the way to enjoy the scenery. This particular view was taken about halfway along, at Rex Lookout. Daintree bound on the Captain Cook highway. Visitors can drive along the Eyre Highway with less than a kilometre between them and the cliffs. The cliffs extend over 85km, and there are five main lookouts, with signed access roads from the highway. The view here is taken from the lookout at the Head of Bight. The sand dunes cover 32km and can be accessed on foot, horseback, quad-bike or 4WD. There are many local operators that offer services to enhance visitor experiences of the area, including Port Stephens 4WD Tours, Sahara Trails Horse Riding and Quad Bike King. Spanning 32 kilometres, the Stockton Bight Sand Dunes can be conquered by quad-bike, sand board, camel, and horseback. Take a cruise up the river on a paddleboat with Captain Cook Cruises. Its cruises extend from Blanchetown to Murray Bridge, and run for up to seven nights. This particular view was taken from Big Bend. Morning mist on the Murray. Visitors can trudge from the top of the Summit Chairlift up a short but steep incline to reach the Fire Hut (pictured). The black-diamond ski runs that start here are not for the faint hearted. In dry season the crater is 2WD accessible; however in the wet Halls Creek is the furthest you can go. 4WDs make it accessible year-round. Visitors can walk around the vast expanse of the crater, but there is no water supply so bring plenty with you. For an aerial view, Northwest Regional Airlines fly travellers over it from Halls Creek airport. In dry season, Twin Falls can be accessed by 4WD (preferably with a snorkel) down a signed track off the Kakadu Highway. Day tours can be taken from Wildman Wilderness Lodge in the Mary River Wetlands. See the falls from the air any time of year with Skytours or Kakadu Air. Drive from Broken Hill along Silverton Rd, following signs to the Mundi Mundi Lookout. Mundi Mundi Plains, home of Mad Max 2 and Priscilla Queen of the Desert, near Silverton. Drive south-west of Murwillumbah, pass through Uki and turn south onto Doon Doon Rd. Mount Warning from Clarrie Hall Dam, Tweed Valley (photo: Legendary Pacific Coast). If you stand on the shore to the left of where boats pull in, you can watch as the planes come in to land at Kingsford Smith Airport. If you’re without a vehicle, Sydney bus route 394 departs from Circular Quay, and route 393 departs from Railway Square. You might see anything from pineapple fish to turtles while snorkelling Bare Island, La Perouse. The Kings Canyon Rim Walk takes hikers on a four-hour walk around 270m-high sandstone cliffs, with amazing viewing points. For less active visitors, there’s the shorter Kings Creek Walk at ground level. Or book a scenic flight through Kings Canyon Resort. The sunset at Kings Canyon is second to none. At the northern end of the beach is Grange Jetty (pictured). The beach is just south of Henley Square -– a popular Adelaide dining spot. If you’re driving, the turn off to Gym Beach is about 10km from Marion Bay. The road down to the beach is unsealed and rough, so take care in a 2WD. Alternatively, hike 6km along the coast from Browns Beach. You can walk, drive or ride a bike over the 655m-long Sea Cliff Bridge, which is part of Australia’s Grand Pacific Drive (Lawrence Hargrave Drive makes up the stretch between Stanwell Park and Thirroul). This particular shot was taken at Clifton, looking to Stanwell Tops. Hot Air Ballooning rides drift across the Kerry Valley. Tours leave from Beaudesert and Canungra and include a champagne breakfast at O’Reilly’s Grand Homestead and vineyard. Front Beach borders Fitzgerald River National Park. It’ll take about 7.5 hours to drive here from Perth or 45 minutes from Ravensthorpe, along the helpfully named Hopetoun-Ravensthorpe Rd. 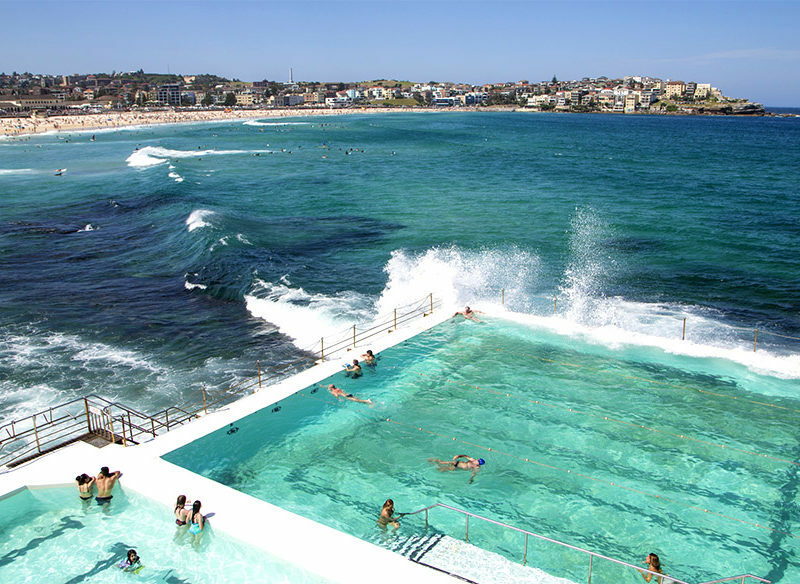 This is Bondi Baths (part of the Bondi Icebergs Club complex). 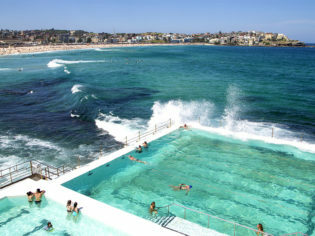 The 50m ocean pool has been a local landmark for over 100 years, and there is now a smaller children’s pool nearby. To see the view firsthand and swim a few laps, sign in as a visitor at the Icebergs entrance, which costs $5.50 per adult. If you want to go to the restaurant or bar, you’ll need to live more than 5km away or be signed in by a member. The Neck is a narrow isthmus separating north and south Bruny Island. It is 25km south of Roberts Point, where car ferries from Hobart dock. This shot was taken from Truganini Lookout – a timber stepped boardwalk that gives visitors spectacular panoramic views. external steps to the peak. To get to Silverton from Broken Hill, drive for about 20 minutes along Silverton Rd. See flocks of magpie geese taking off on a tour with Kakadu Animal Tracks Safaris, costing from $205 for adults and $135 for children. Safaris leave from Gagudju Lodge Cooinda. To reach Arthur-Pieman Conservation Coastline, drive west from Smithton along the Bass Hwy to Arthur River Rd then down Gardiner Point Rd. There are 4WD tours and walking trails here, as well as the Pieman River Cruise. Drive five minutes north along the coastline from Caloundra. Dicky Beach is at the end of Beerburrum St. The only one way to access this secluded hideaway is by light aircraft to Mitchell Plateau, followed by a helicopter transfer. Exploring the Kimberley Coastal Camp (photo: Jordan Smith). Gorge Road into the Park is all bitumen and ends at Nitmiluk National Park Visitor Centre, a great starting point for hiking. Take the 24km return walking trail that commences at the centre. Smitt Rock is in Gorge Four of the 13 sandstone gorges and you can camp overnight here. This view of Main Range at Perisher was taken from the lookout behind the Blue Cow terminal building, looking south to Mount Townsend. The lookout is accessible on foot when guests get off the Skitube at Blue Cow. Perisher has a massive ski area to explore. Jump on a helicopter with Cape Crawford Tours at the air base opposite Heartbreak Hotel then fly to these ancient sandstone columns. Book a skydive with Coffs City Skydivers to see the central coast from above, while free-falling back towards earth. Mid-jump, enjoy views like this one, taking in views of over 200km of coastline and the Great Dividing Range. Drive to the summit following Pinnacle Road. In winter, the road can close due to snow or ice cover so check beforehand. The lookout is a two-minute walk from the car park. Various tracks allow you to bushwalk, cycle or horse-ride. Mt Wellington, Tasmania: International Traveller magazine editor Leigh Ann Pow loves Tassie, any time, any where. Point Lowly Lighthouse is on a point jutting into the northern end of Spencer Gulf. Drive from Whyalla to Port Bonython, which takes about 20 minutes. Take Caves Road through what is known as the S Bend, or Kodak Korner as locals call it. There is a viewing platform on the left which looks across the road and to the Boranup Karri Forest. Access to the National Park is via sealed Karijini Drive. Most roads inside the park are gravel, but 2WD accessible. Follow the signs to Fortescue Falls. From there, take the walking track into Dales Gorge and past Fortescue Falls then turn right to Fern Pool. Windward Balloon Adventures start at Northam Airfield and fly over the west coast of Perth, Mount Ommaney, Mount Bakewell and the township of Northam. Drive 117km east of Darwin along the Arnhem Highway. From the Ubirr Arts Centre, walk 1km to view Indigenous rock art and access the lookout via signed paths. From the North West Coastal Highway take Denham-Hamelin Road to Shark Bay. Or take a scenic flight with Shark Bay Air Charters. The winery is on the corner of Rosedale and Gomersal Roads, Tanunda. This view is from the top of Schoff’s Hill. Walk for 15 minutes along the track that starts at the cellar door. Hellfire Bay Beach is the easternmost beach on the 15km-long Coastal Track and takes 2.5 hours of hard walking. The easiest option is taking the Merrivale Road out of Esperance. Turn right onto Cape Le Grande Road and left onto Lucky Bay Road. Hellfire Bay is the first beach you come to, opposite Frenchman’s Peak. There’s also a 4WD trail from Esperance to Le Grande Beach. This is at the Franklin end – near the first section of the Frenchman’s Cap trail. To be on the water, take a scenic cruise with Gordon River Cruises. Cruising through the wilderness of the gorgeous Gordon River. Drive along the Stuart Highway in Port Augusta, about 310km north-west of Adelaide. Here, you see Woolnorth Point in the foreground, Cape Grim facing to the right and Mt Cameron and Marrawah in the distance. To see it, book a flight with local helicopter operator Osborne Aviation Services or experience it on foot with Woolnorth Tours. These balloons are taking part in the annual Canberra Festival Balloon Spectacular. However, rides can be booked at any time of year with operators such as Balloon Aloft and Dawn Drifters. Nothing but hot air, over Lake Burley Griffin (photo: Adrian Kelson). Just a 10-minute stroll from the Mt Field National Park Visitors Centre, Russell Falls can be accessed via a sealed path suitable for wheelchairs. The walk will also take you past some of the tallest hardwood trees in the world. Return by the same track or cross a bridge below the falls and follow the creek back. This view is from the summit of Mt Amos, part of the granite mountains known as The Hazards. It is a strenuous three-hour return hike up. If you don’t want to tackle it alone, consider a guided hike such as Travelwild Tasmania Tours. Sailing into Wineglass Bay on the Freycinet Peninsula. The lighthouse is located near The Gap on South Head, 10km east of the CBD. Walk through Signal Hill Reserve, heading south, and after about 200m the view of the lighthouse and cliff will appear. At the south-eastern tip of the island, this is also its highest point. Turn off Phillip Island Tourist Road and down Woolamai Beach Road; park at Woolamai Beach Surf Club. From there, walk up the beach to Magic Lands and take the inland boardwalk, which has several routes around the cape of 2-4km return. The view pictured was taken from Woolamai Beach looking east. From the Kalbarri National Park car park, the lookout can be reached via a 500m walking track. Gazing down, the gorge walls plunge 150m to the river below, where river red gums create a striking contrast against the earthy Tumblagooda sandstone. Kalbarri Tours offers tailor-made group charters to the gorge, as well as canoeing tours for more adventurous types. Guests at the luxurious Southern Ocean Lodge have access to the star-gazing platform pictured, which overlooks Hanson Bay while being just a short minute’s walk along the boardwalk from the lodge. High luxury: Southern Ocean Lodge, Kangaroo Island. At 3207 square kilometres, Mornington Wildlife Sanctuary is one of the largest non-government protected areas in Australia. The Mornington Wilderness Camp has ten safari-style tents and is open to visitors from May to October. It is accessible by 4WD or private air charter only. By 4WD, follow the Gibb River Rd 330km from Derby. Turn off at Mt House and continue south for 88km. If you’d like to capture this view, take a scenic flight out of Broome with King Leopold Air. Follow the Princes Highway south from Sydney towards Kiama before taking the Riverside Drive exit and following signs to Rangoon Reserve. With the Minnamurra River dividing the township from the ocean, visitors can access the beach closest to the island by boat. Otherwise, at the ar end of the beach is a car park with a rough walking track down to the sand. It is at this far end with many rocks that this view was taken. The view pictured was taken at sunrise while standing on the banks of the fishpen, located on the southern side of the bottom lake. This view is taken at the Popran Creek crossing, in front of the main horse riding complex at Glenworth Valley. However, the best way for visitors to see the running in of the horses each morning is to camp the night so you are there in time. The paddocks the horses are kept in overnight are regularly rotated, meaning their route can vary. Check with staff for information on the safest location to view them. The daily mustering of the property’s 200 horses is a sight to behold. Gunlom Falls are accessible by 4WD vehicles along the Gunlom Track, near the southern entrance to Kakadu National Park. Drive carefully as the track is unsealed, subject to flooding and sandy in areas. It is impassable in the wet season but open between May and October. Once there, visitors can swim at the base of the falls or take the walking track to the top where there are more swimming holes – and where this view was taken. The walking track is steep, uneven and suitable for people with a medium level of fitness. Remember to take plenty of water for the trek. Turn off the Princes Highway at Genoa Peak Road, west of Genoa. Travel 8km to the car park and picnic area. From there, take a 1.5km return walk to the summit (allow an hour each way). A steel ladder gives access to the viewing platform. Standing at Genoa Peak is a supremely peaceful experience. This stunning view was taken on board an El Questro scenic flight. The experience takes visitors above the homestead in an open-door helicopter ride, over the Cockburn Ranges andthrough the Pentecost and (pictured) Chamberlain Gorges. A 30-minute scenic tour starts at $280 per person. The only way travellers can access Eagle Falls is via a helicopter flight with North Star Cruises, aboard the expedition ship True North. It offers a number of scenic flights around the area, including a five-star picnic package onsite. Follow the Goldfields Highway from Kalgoorlie to Menzies before turning left at a well-signposted service station onto a gravel road heading northwest.Continue a further 50km to the sign posted turn to Lake Ballard car park. From there, visitors can walk throughout the 10-square-kilometre salt lake, featuring the Inside Australia exhibit by Antony Gormley. There are 51 sculptures in total, said to represent local members of the community. This shot was taken near the visitor entrance and shows Snake Hill in the background, about 600m from the lake edge. Antony Gormley’s surreal Inside Australia, Lake Ballard, WA (photo: Elise Hassey). This shot was captured at sunrise from the sand right next to Deep Water Point Jetty. Get there at least 20 minutes before sunrise to see the colour changes in the sky. The WA Christmas tree, Nuytsia floribunda, produces spectacular flowers in summer but is rarely found outside the south of the state. Visitors can self-drive to the park by car and see the park’s wildflowers, fauna and idyllic beaches, but for local knowledge and expert advice, try a guided tour such as with Esperance Eco- Discovery Tours. Alternatively, Aussie Bight Expeditions runs wildflower tours during spring. Just opposite Cape Tribulation Camping, Lot 11 on Cape Tribulation Road, is the Dubuji Boardwalk. The boardwalk leads directly to Myall Beach where this view can be seen when looking south. This pristine beach has a fringing coral reef that’s exposed at low tide: a great place to explore the rockpools. Inviting as it looks, you can’t swim here in summer stinger season. It’s also one of the many Tropical North Queensland beaches where the Daintree rainforest fringespristine white sand. This spectacular 65km, six-day walk is very popular and must be booked in the summer peak, November 1 to April 30, when you can only walk north to south. Private cars can be parked at both Cradle Mountain and Lake St Clair ends. Otherwise bus operators such as Tassielink and McDermotts Coaches, service both ends from major towns. This particular shot was taken from the summit of Cradle Mountain itself. The 15km walking and bike trail commences at Castletown Quay and follows the foreshore through Esperance, taking in the Esplanade, Rotary Lookout, West Beach and Blue Haven and finishing at Twilight Beach. Sections can be accessed from car parks along its length. This view is from the car park at Salmon Beach, about 11km along the trail. There’s a 40km Great Ocean Drive, too, from the Cannery Art Centre along the coast to Observatory Point, Nine Mile beach and Ten Mile Lagoon before looping inland to Pink Lake and the Glass Gallery. Known as Karlu Karlu and a sacred site to the traditional Aborginal owners, the Devils Marbles can be explored on foot after a short drive off the highway. There is a 15-minute self-guided walk commencing at the car park, as well as a network of other tracks. During the cooler months, guided walks and talks are available – contact the Tennant Creek Visitor Information Centre for details. The Devils Marbles are a geological phenomenon filled with mystery. NT. This picture was taken looking north-west in the 15km-long, 22-peak Western Arthurs, south of Lake Pedder in the Tasmanian Wilderness World Heritage Area. You access the range from Scotts Peak Dam on a challenging walk of two to three days, or longer to traverse the whole range. Tasmanian Wilderness Experiences offers guided walks through the Western Arthurs. From Winton, follow Kennedy Development Road in the direction on Boulia, then turn left at Cork Mail Road for 45km and the entrance to Carisbrooke Station is on the left. The station also has a 1100m airstrip, with light aircraft flying to Winton. This view was taken from the top of an escarpment that runs parallel to Jundah Road, bordering the back of the property, looking back towards the station. The escarpment reaches 80m in places, giving great views area. It can be accessed by car from Carisbrooke, but it can be limited during the wet season. By car, follow Bogong High Plains Road from Falls Creek towards Omeo – the road is sealed but closes during the winter season, so be prepared. Follow the road for about 7.5km and park at the signposted entrance. From there it is an easy 750m walk to the hut. “This photograph celebrates an era of legends, when cattlemen roamed the high country of Australia’s southern range. This hut was one of the men’s old ramshackle resting places. It is captured here in the first light of morning between the spreading snow gums, a scene both of beauty and nostalgia. Vehicles can access Nambung National Park from the north via Cervantes, or from Perth on the scenic Indian Ocean Drive. Access to the Pinnacles area itself is via a 1.2km marked walk trail or a 4km drive through the park. Visit the Pinnacles Lookout for a more elevated view. Western Australia’s own moonscape: The Pinnacles. The easiest way to see this sacred monolith is to fly direct to Ayers Rock Airport (Yulara), which is about 22km north of Uluru. Alternatively you can drive or catch a tour bus from Alice Springs with an operator like Travel Aust (travelaust.com.au), which offers daily transfers. The centre of it all: Uluru. Fitzgerald River National Park contains more than 1800 plant species, 62 unique to the park, and more animal species than any other park in Australia. There are entry points on both sides: from the western side via Bremer Bay, or the eastern side via Hopetoun. The central area of the park, however, is only accessible by 4WD or on foot. On Tasmania’s East Coast above Wineglass Bay, 180km north-east of Hobart. This photo is taken directly in front of Diamond Island Resort, at 69 Tasman Highway, about 2km north of central Bicheno, looking north up the coastline. The ancient, 600km Finke River rarely flows and is often just a series of waterholes. There’s a permanent one in the gorge at Glen Helen in West MacDonnell National Park, which is also one of the few points where you can access the river by sealed road. Glen Helen Resort has motel-style accommodation and camping. Australia’s northernmost island, a 1 hour flight of Cairns. After taking the flight to Lizard Island from Cairns, Cook’s Look can be accessed via a 4 kilometer steep hike to the vantage point. There, panoramic views of the island can be enjoyed, in between snorkels of the Great Barrier Reef of course. Declared a national park in 1939, Lizard Island’s 24 beaches and surrounding waters have remained beautifully pristine. This is a shot of the Reefviewer glass-bottomed boat in the centre of the sanctuary. Tantabiddi covers only four square kilometres but is home to a wealth of marine life such as green sea turtles, estuary cod, parrotfish and clownfish. Ningaloo Ecology Cruises offers boat and snorkelling tours in the sanctuary, while Birds Eye View offers microlight flights for great aerial views like this. You can drive to Hotham, at the crest of the Great Alpine Road – the highest bitumen road in Australia. There are also several coaches that service the area, such as Christian’s Bus Co and O’Connell’s Omeo Bus Service. Otherwise, Hotham’s airport is serviced by QantasLink from Sydney in peak season – the flight takes 80 minutes – and charter flights from across Australia year round, and is a handy 20km from the slopes. But while snow-based activities are popular during the winter months, in summer the landscape transforms into grassy mountain ranges speckled in wildflowers. Various tracks and trails thread through them, ideal for hiking, biking and horse riding. This view is at the end of the cape, which has a detached sea stack known as the Candlestick. These dolerite seacliffs are among the tallest and oldest in Australia. Kayaking is available with operators such as Roaring 40s Ocean Kayaking. To see it from the land, the Cape Hauy Track is a five-hour return trek that begins in Fortescue Bay, taking in heath and woodland before the views of the cliffs. This shot of Ormiston Gorge was taken from the banks of the creek, a very short walk from the car park. The visitor centre is about 8km from the Ormiston Gorge turn-off on Namatjira Drive, and although roads are sealed, they can become impassable after heavy rain. However, the best way to see the gorge is to walk one of the many trails available, ranging from the five minute Waterhole Walk, which has wheelchair access to the end of the paved path, to the Ormiston Pound Walk, which takes up to four hours to complete. For keen hikers, the Larapinta Trail also passes through the area, but it is a challenging long-distance walk that requires careful preparation. This image was taken from the base of steps down to the waterhole at Mossman Gorge. The the best way to see this view first-hand is on fivefoot. Guided walks are available, which encompass other sites that are culturally significant to the local Kuku Yalanji people. The vivid green of the water pictured tends to happen after extended periods without rain. According to the photographer, for ultimate serenity, the best time to visit is early in the morning before the crowds set in. Mitchell Plateau is accessible by car during thedry season via an unsealed 4WD track off the Gibb River Road, along Kulumburu Road. Continue along it, turning at the Mitchell Plateau Track and drive on to the Mitchell Falls campsite. It is a 3km walk from the campground to the falls, passing a variety of habitats, waterholes and Aboriginal rock art. To get another perspective of the Mitchell Falls, flight tours of the plateau are available with operators such as Bush Flight and Slingair Heliwork. This shot was captured from the north end of Soliders Beach, looking up to the lighthouse, which can be seen in the distance to the left. There are also amazing views from the lighthouse itself. Visitors can have a guided tour around it or even spend the night there, in nearby cottages that were once the lighthouse keeper’s quarters. Virgin Australia flies to the Cocos (Keeling) Islands from Perth via Christmas Island. Comprising the South Keeling Islands (which ring a central lagoon) and the separate North Keeling Island, only two of the 27 islands are inhabited. These coral atolls were visited by Charles Darwin in 1836 and his studies here contributed to his theory on how coral reefs form. The islands were settled for copra production in 1826 and the small population is descended from the original, mostly Malay Muslim workers. They voted to become part of Australia in 1984. A quintessential tropical paradise, you come here to dive, snorkel, camp, surf, kite-surf, birdwatch and chill out, not party. Reach this scenic outback gorge by turning right at Parachilna (if approaching from the south) towards Blinman. It’s a dirt road and OK for 2WDs unless it’s been raining and the creeks are flowing. You can camp anywhere in the gorge for free at any time of year, but it’s best seen in spring. This region is great for 4WDs, with a network of Public Access Routes allowing you to traverse private land – download a map and always check road conditions. Parachilna itself is home to not much beyond the Prairie Hotel, famous for its Flinders Feral Food using local ingredients. “It was a beautiful winter’s day. After getting some shots at the base of Cradle Mountain, I headed back, but after walking for half an hour I decided it wasn’t the right way. I backtracked and looked up to see a full moon rising. I quickly set up my tripod to capture this amazing sight. I was thinking how fortunate I was that I had taken the wrong track… and then the guide markers disappeared under snow and I became hopelessly lost. I’d started the walk to Marions Lookout at 1pm; it was now 9pm and I was buggered. I sank to my knees and yelled, ‘Help!’ “To my amazement, a male voice replied, ‘Are you right, mate?’ He told me to walk towards his torch. “He introduced himself as Wes Moule and he was going moonlight skiing. KI has plenty of natural attractions (see issue #36) – beaches, wildlife, seafood, sheer peace – but these rock formations in Flinders Chase National Park, in the south-western corner of the 150km-long island, are a big draw. The granite boulders, decorated with orange lichen, sit atop a bald rock outcrop that slopes down into the sea, and have been sculpted with tafoni (deep cavities) – by wind, rain and sea spray. The classic shot of the rocks is taken facing north, but this group is to the south-west. You can get to KI by car ferry or plane. Drive up towards Mt Buller from Mansfield, then take a left after the Mirimbah tollgate onto Stirling Road. Then it’s 8km of sealed road to Telephone Box Junction, the limit for vehicles in winter. But in the warmer months you can continue to the gravel by 2WD Circuit Road: turn left and drive for 20km to the junction with Clear Hills Track. From there it’s a 20-minute walk or short 4WD drive to Craig’s Hut. The spectacular, minimally developed Mt Stirling attracts cross-country skiers, horse riders and bushwalkers. The original Craig’s Hut, inspired by those used by cattle drovers for temporary shelter, was built for the movie The Man from Snowy River (1982) but burnt down in a bushfire. This replica – with a tin rather than bark roof – was completed in 2008. The shot was taken at sunrise. There are a couple of hundred huts (or their ruins) scattered through the Australian Alps; some built for fishermen, skiers, miners or hydro workers as well as graziers. Most are only accessible on foot/bike/horseback. Wallace Hut near Falls Creek (see number 26 in this list) is thought to be the oldest, built in 1889. A further 2km down the Bogong High Plains Road is Cope Hut, built for skiers in 1929, while Fry’s Hut in the Howqua Hills Historic Area, 34km from Mansfield, is another good example. See the sites below for more information. “I spent three days camping in the snow at Craig’s Hut with a good friend a few years ago and it was an experience we will never forget. The peace and solitude were incredibly unique. We drank ice-cold water from a nearby stream and built a campfire from fallen tree branches. Access to Whitsunday Island, one of the undeveloped islands in the group that forms the Whitsunday Islands National Park, is usually by boat from Airlie Beach/Shute Harbour or via one of the other island resorts, but there are helicopter/seaplane joy flights if you want to see it from the air like this. The Whitsundays offer a range of accommodation options from camping to qualia, Hamilton Island’s luxury resort, but the perfect way to experience the islands, reefs and the swirling turquoise water and pure white sands of Hill Inlet is on your own yacht – look into skippered or bareboat hires. You can anchor overnight at Tongue Bay (at the left of this picture), and walk up to a lookout at Tongue Point for a view over the inlet. Visit at low tide to see the best patterns. Whitehaven Beach stretches 7km south from Hill Inlet and is also worth pointing a camera at: it’s one of Australia’s most beautiful beaches, boasting sand of such purity you could make optical glass from it. Blue view: Hill Inlet, Whitsunday Island (Ken Duncan). You’ll be speechless within seconds of take-off as you’re introduced to Purnululu National Park’s Bungle Bungle Range, a carved 350 million-year-old landscape of gorges and pools surrounded by a soft, green blanket of grassland. Since its discovery in the 1980s, what was once Australia’s best-kept secret is now internationally recognised as a top destination. Because most of the area is inaccessible by car or foot, the best way to appreciate the tiger-striped beehive domes is from a plane or helicopter. No matter how many times you soar over the Bungle Bungles, they always look different, depending on the time of year, the time of day and prevailing weather conditions. It’s a place you could visit time and again, and we urge you to do it at least once in your lifetime. Constant erosion by wind and sea of the limestone cliffs formed caves and then bridges; when these collapsed – the fate of the nearby Island Archway in 2009 and London Bridge in 1990 – they left these stacks up to 45m high isolated offshore. They’re a highlight of the Great Ocean Road – probably Australia’s most scenic coastal drive. Note that you can shave 50km off the drive from Melbourne by taking the inland route via the Princes Highway, but then you’d miss out on the other attractions. Formerly called the Sow and Piglets until being renamed the 12 Apostles in the 1920s, they have never numbered 12 – though it depends who’s counting. Continuing erosion means they could topple at any time, but you can currently see seven stacks to the west of the 12 Apostles viewpoint, and two more to the east. Sunrise – the time this shot was taken – offers the most dramatic lighting from the viewpoint, followed by sunset. And visit at dawn or hang around after the sun goes down to see little penguins – they come ashore each evening on the beach at the base of the 70m cliffs. If you want to get to the water’s edge yourself, the nearest access is via Gibsons Steps, 1km to the east, but access is restricted. “People are not normally allowed onto this beach because of the penguin colony, but I was granted special permission and had to be accompanied by a ranger. We arrived in darkness to position ourselves for sunrise; at first light the penguins began to prepare to go out fishing. Famous to Midnight Oil fans for featuring on the cover of Diesel and Dust – also shot by Ken Duncan – this old homestead at the foot of the Mt Lofty Ranges was abandoned long ago by smallholders unable to sustain a livelihood on this rain-starved land. Ironically, this iconic scene of golden rural Australia is looking a lot greener now after all the recent rain – if you visit in September-October, you might even find it surrounded by canola in bloom, though the crops are rotated. Hence you might not see this this exact scene. Drive north on the Barrier Highway for 6km from the centre of the historic town of Burra – once a major copper mining centre and also a location used in the filming of Breaker Morant. You’ll see the homestead on your right about 100m off the road. But bear in mind it’s on private property, so unless you ask permission for a closer look, you can only view it from the road. The building faces west so visit in the late afternoon to see it in its best light. Most of the Great Barrier Reef’s attractions lie under the surface, of course, and Hardy Reef in its southern section (further from shore and therefore less trafficked) is a great place to see them. Expect a stunning array of polychromatic hard and soft corals, a couple of hundred fish species – including tusk fish, trevally, snapper, cuttlefish, moray eels, barracuda, unicorn fish, surgeonfish, angelfish, wrasse, gropers – not to mention starfish, giant clams and even the occasional passing whale. But you’ll have to take to the air to see this sight and the other major local attraction, Heart Reef, which is in a protected area off-limits to underwater tourists. Hardy Reef features Fantasea’s permanent Reefworld pontoon, where you can snorkel, dive, do a semi-submersible tour and even stay the night, while further out is Cruise Whitsundays’ Knuckle Reef pontoon. Both offer helicopter flights starting from $110/$129 for 10 minutes. This image was taken from a chopper at midday. Those with deeper pockets can also fly out from the Whitsunday Islands or the mainland – by helicopter or seaplane – in 30 minutes to save themselves the long boat ride. Hardy Reef from the air.